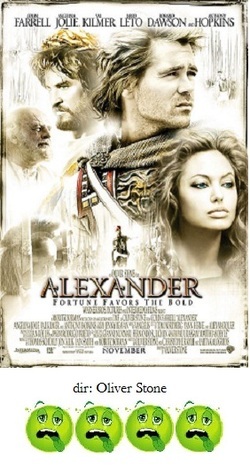 Oliver Stone's historical epic, Alexander, was supposed to be the big holiday release and Academy Awards magnet of 2004. It was being touted as a sure thing, the film to beat. The anticipation was tremendous. Then critics and audiences finally got to see it, and they all ran gagging from the theatres in droves. What happened? This is the story of the rise and fall of the conqueror from ancient Macedonia, Alexander the Great, who vanquished most of the known world and is still widely considered one of the greatest military leaders ever to have lived. Sounds like a can't fail basis in which to create an expensive epic, doesn't it? The usually talented Colin Farrell was cast as Alexander, and right away, the problem becomes apparent. Farrell, with his locks dyed a fake looking blonde, is unable to completely cover his Irish accent. He just looks uncomfortable and miserable riding a horse in the deserts, swamps and jungles, and reciting the pretentious dialogue while wearing a toga. Needless to say, he's unable to quite convey the required larger-than-life persona, so he simply shrinks under the morass of the production. Other casting mistakes include Angelina Jolie as Farrell's mother (! ), who must've had him while she was still in diapers. She also affects the bizarrest and most laughable Russian (?) accent and spends the movie stroking her pythons and slinking in the shadows. As the father, Val Kilmer overacts so wildly he not only chews the scenery he tears it down around in giant swaths everytime he appears on screen. Rosario Dawson is the wild bride of Farrell's who does little except hiss and shriek and bare her fingernails like claws, and Jared Leto is Farrell's trusted companion, and sometime lover, who just stares moonily through thick eyeliner at Farrell whenever he eyes another man or woman with lust. As far as the story goes, there isn't one. The movie consists of one boring battle scene after another differentiated only by the helpful title cards which tells us where they are occurring. There's no real strategy involved, no insight into how Alexander was able to do what he did; it's just scores of costumed extras flailing about with swords and shields until most of them are dead. There is also a highly unnecessary framing device where Anthony Hopkins, as Ptolemy, intones with grave seriousness the whole story of Alexander to a group of young students which adds nothing to the film except another highly paid star to the film's already monstrous budget. Alexander flunks in all areas. It's not good history, it's not good entertainment and it's not good film making. The whole production seems to have simply overwhelmed all involved and it all comes crashing down, leaving a large, inert, immovable mass.